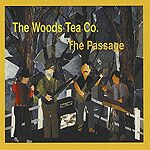 By The Woods Tea Co.
Like West Coast folkies Marley's Ghost, Vermont's The Woods Tea Co. plays a broad repertoire of traditional musics, from traditional Celtic music to sea shanties, mixing it with contemporary folk and a handful of original songs. Their latest CD features a new lineup, with Tom MacKenzie joining original members Howard Wooden and Mike Lussen to fill the void left by the 2006 death of Chip Chase of injuries suffered in an automobile accident, and the 2007 death (heart attack) of Rusty Jacobs. What's heard on this disc is three friends blessed with exquisite talent and a tremendous musical empathy. Playing just about anything with strings (guitar, banjo, bouzouki, dulcimer, ukulele, viola, dobro) and other traditional instruments, the band's arrangements and rich vocal harmonies lend an almost Irish feeling on most of the tracks. And on MacKenzie's "My Monday," the band sounds like an English music hall combo playing an old Broadway show tune. The final two tracks are taken from a never-released Christmas album, and feature the original quartet of Wooden, Lussen, Chase and Jacobs in a spirited rendition of "God Rest Ye Merry Gentlemen" and Chase's last song, the sentimental track "The Waterfall."